if, else, switch, case, default – Used for decision control programming structure. break – Used with any loop OR switch case. int, float, char, double, long – These are the data types and used during variable declaration. for, while, do – types of loop structures in C.
void – One of the return type. goto – Used for redirecting the flow of execution. auto, signed, const, extern, register, unsigned – defines a variable. 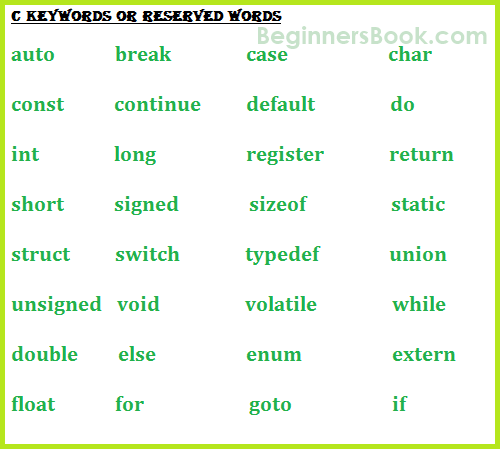 return – This keyword is used for returning a value. continue – It is generally used with for, while and dowhile loops, when compiler encounters this statement it performs the next iteration of the loop, skipping rest of the statements of current iteration. enum – Set of constants. sizeof – It is used to know the size. struct, typedef – Both of these keywords used in structures (Grouping of data types in a single record). union – It is a collection of variables, which shares the same memory location and memory storage. Just tell me is this for turbo c or c++? Is this for Turbo V or C++? This is a C language standard. It should be the same for all compilers. I like what they talking about, i understand it clearly and i hope this website will help me understand more about programing.